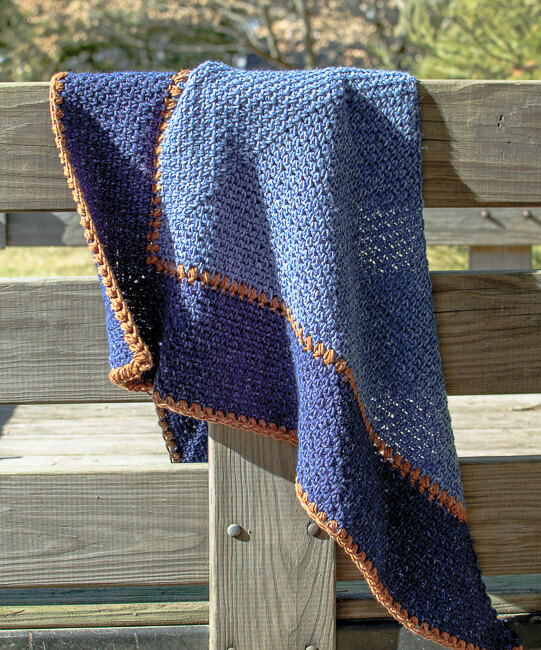 Don’t let the name fool you … this Weekender Shawl Crochet Pattern isn’t just for weekends! Throw it on any time for a relaxed and stylish vibe. Best of all, the stitch pattern is fully reversible so no matter how you wrap or drape it it’s always showing it’s best side! I’m especially loving it worked up in Lion Brand Jeans yarn … don’t they make a great combination?! Finished shawl as written measures approximately 56 in. wide and 24 in. long, but can be easily customized to any size. Single Crochet Puff Stitch (sc-puff) – Insert hook where indicated and pull up a loop (2 loops on hook), *yarn over and insert hook into same space and pull up a loop (4 loops on hook), repeat from * once more (6 loops on hook), yarn over and pull through all 6 loops. Row 3: Ch 1, work 1 sc in first st, ch 1, *1 sc in next ch-1 sp, ch 1,** repeat from * to ** to center ch-2 sp, [1 sc, ch 2, 1 sc] in center ch-2 sp, ch 1, work * to ** to end, work 1 sc in last st, turn — 8 sc. Rows 4 through 43: Repeat Row 3 through Row 43 or until CA is finished, fasten off CA and turn — 88 sc. Row 44 (Single Crochet Puff Stitch Row): Join CB and ch 1, work 1 sc in first st, work 1 sc-puff in each ch-1 sp across to center ch-2 sp, work [1 sc-puff, ch 3, 1 sc-puff] in center ch-2 sp, work 1 sc-puff in each ch-1 sp across to end, work 1 sc in last st, fasten off CB and turn — 2 sc and 88 sc-puff sts. Rows 45 through 63: Join CC and repeat Row 3 through Row 63 or until CC is finished, fasten off CC and turn — 128 sc. Row 64: Repeat Row 44 — 2 sc and 128 sc-puff sts. To make the shawl larger, join next color and repeat Row 3 until you reach your desired length. 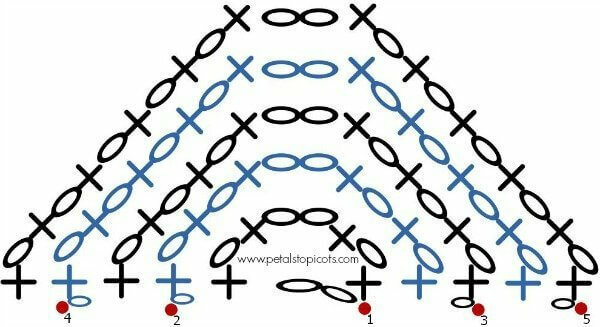 End with one repeat of Row 44. Add some custom accents if you’d like. Perhaps some fluffy pom poms or some fun tassels? Check out my tutorial for making tassels easily. I love this stitch and would like to use it in a twisted cowl. It is hard for me to figure out the stitch pattern since it is written specifically for your lovely weekender shawl. Would you be willing to clarify for me? Thank you! I was wondering how much of the Top Stitch color you used? I was thinking of beginning with it and was wondering if there was enough to do that? Or would I need to buy a 2nd skein? By working in the single crochet at the beginnings and ends of each row, you are adding increases there as well. 3 colors worsted weight yarn, approx. 246 yd each. If using Lion Brand Jeans Yarn that would be 1 skein of each.